Chaos is horrible for business - unless your business is shadowrunning. The Big Ten megacorporations of the Sixth World are reeling, with scandals, disasters, and crippling attacks coming at them from all angles. NeoNET is scrambling to maintain AAA status, Ares is trying not to let the secret rot at the heart of the corp become public, while Aztechnology, fresh from taking on a dragon in Amazonia, is looking at a facedown with another great dragon. And that's not all - every corp is a pile of schemes, turmoil, upheaval, and teetering chaos, because that's how they operate. 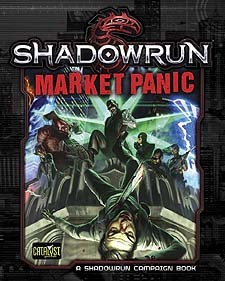 Market Panic runs down the state of the Big Ten for Shadowrun, providing the background, story developments, and plot hooks players and gamemasters need to add excitement, intrigue, and Sixth World flavour to their adventures and campaigns. If you're going to run for or against the big megacorporations - and that includes all shadowrunners - this is critical information to have so that you know what you might get thrown into, who you're going up against, and how you might obtain intel to survive.